Wheelersburg’s Tanner Holden scored 50 points in the Pirates’ 83-64 win over Russell (Ky.) Tuesday. WHEELERSBURG — Some players don’t score 100 points in their entire four-year careers … Tanner Holden has done so in two games this year. 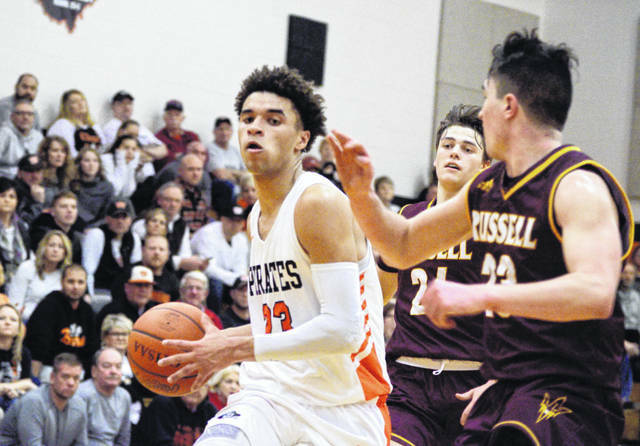 Wheelersburg’s senior forward turned in his second 50-point performance of the season Tuesday night in an 83-64 win over Russell (Ky.) in non-conference play. And he made it look easy while doing so. Holden finished the night with exactly 50 points on 20 field goals alongside 13 rebounds, three assists and four blocks. He was 9-of-14 from the line and scored 17 in the third quarter alone. But possibly the most impressive part of his performance came on the offensive glass, where he consistently got second chance buckets to fall while keeping his team out in front. While Holden’s night was certainly special, he was quick to acknowledge the things him and his teammates could still work on. Defense was at the forefront of that conversation. With Russell’s defense focused on Mr. Holden, senior Trent Salyers often saw open looks beyond the 3-point arc … which he often took advantage of. Salyers hit a total of six 3-point field goals, five of which came in the first half, for a total of 18 points. Coming into Tuesday’s contest, Wheelersburg (14-0) was the Associated Press’ No. 2 ranked team in the state within Division III. While that’s not something Ater and his players have focused on, it’s definitely something they’ve acknowledged. Following Holden’s magnificent night, Salyers ended the night with 18 points on six 3-point field goals alongside four rebounds. Michael Miller added five rebounds, and Connor Mullins had two points, three boards and two assists. The Red Devils (6-10) were led by Tristan Miller’s 24 points and four rebounds while Charlie Jachimcuzk finished with 19 points. Jared Goodman also chipped in, scoring 11 points and tallying three assists. The Pirates will try and stay undefeated Friday night, and near the top of the Division III AP rankings, when they travel to Northwest. Russell: 22-48 FG, 13-18 FT, 7-19 3pt. (Miller 6), 21 rebounds (Cantrell 5), 14 turnovers, 5 assists (Goodman 3). Scoring: Miller 24, Jachimcuzk 19, Goodman 11, Bell 7, Wheeler 2, Cantrell 1. Wheelersburg: 32-55 FG, 11-16 FT, 8-21 3pt. (T. Salyers 6), 31 rebounds (Holden 13), 14 turnovers, 8 assists (Holden 3). Scoring: Holden 50, T. Salyers 18, Darnell 3, Mullins 2, J. Salyers 2, Clevenger 2.
https://www.portsmouth-dailytimes.com/wp-content/uploads/sites/28/2019/01/web1_Holden-2.jpgWheelersburg’s Tanner Holden scored 50 points in the Pirates’ 83-64 win over Russell (Ky.) Tuesday.